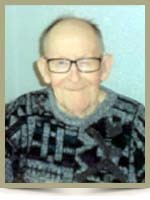 Zong, Clarence Alfred, 87, of Caledonia, Queens County, passed away on Wednesday, February 8th, 2012, in the Queens Manor, Liverpool. Born in Caledonia, he was a son of the late Clarence Jacob and Olive Rae (Murray) Zong. Clarence worked as a mechanic for many years at the Caledonia Irving Station and Steel and Engine Products, Liverpool before retiring from the Nova Scotia Power Commission. He enjoyed hunting, traveling and was well known for his ability for caning chairs. He was an avid cat lover, Clarence adored all animals and could often be found training raccoons on his property. He was a former student of the Nova Scotia School for the Blind and was able to read Braille. He is survived by his loving wife of 64 years, the former Kathleen Judge; son Clarence Zong (Mary Jo Conway) of Hibernia; grandchildren Jimmy Zong (Cindy Conway), Rhonda (Neil) Frail, Ivan Zong (Shana Selig), Jessica Mansfield (Eddie MacNutt), Krista Marie Holder; great grandchildren Tobias, Kaleb, Riley Zong; sisters Gertrude “Trudy” Mugridge of Toronto, Ontario, Erma Melong of Bridgewater. He was predeceased by a son James; sister Kathleen Smith; brothers James, Lawrence and Terrance. Mrs. Zong and Family: We are very saddened to hear of Clarence’s passing and offer you our deepest sympathy. We met Clarence after my mother Marjorie moved into the manor. We usually included him in our visits with our Mom when we sat around one of the dining room tables. He seemed to look forward to these times especially his talks with Bob and would always ask when we were coming again. We will miss seeing him around. Hold your memories close to your heart. Kathleen, Clarence, jr. and Famly, I want to express my deepst condolences over the passing of Clarence. I know no mere words can ease the pain you now feel but sometimes knowing that others care may help you in a small way.